Liquid Polymers | EGM, LLC. EGM has been constructing emulsion polymer dilution equipment since opening for business, and the reputation of constructing the best emulsion polymer units in the world is well-deserved. EGM pioneered many innovations for liquid polymer preparation and customers who purchase these systems are rewarded with reliable and consistent operation. Multiple design types are offered to suit the specific polymer chemistry, dosing strategy, and desired equipment scope. 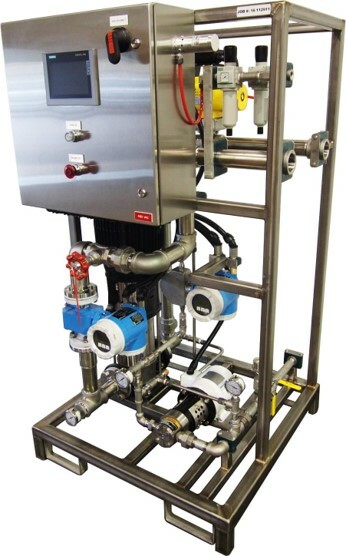 Batch feed systems are available for tank-based aging strategies in capacities from 5 GPM to 200 GPM tank filling rates. These systems can be equipped with manual control, speed-pace control, or true ratio control strategies pending the application requirements. Direct feed units can be equipped for single or multi-point dosing applications and can be configured with hard-wire or PLC based controllers pending the complexity of the feed strategy. Many direct feed units feature multiple modes of operation where the user can run variable volume and fixed concentration or fixed volume and variable concentration to meet the process-specific requirements. Coagulant and solution type polymer systems can be constructed in any capacity required and materials of construction can be configured for use with coagulant products like polyDADMAC, polyamine, EpiDMA, PAC, ACH, alum, ferric sulfate, and ferric chloride. Systems can be configured for single and multiple dosing points and can be equipped with either manual or automated dilution loop hardware.